The Sony Xperia Z1 has quad-band 2G and 3G connectivity across all regional models, and support for more LTE bands than you can shake a stick at. Outside LTE coverage, the Z1 is rated for mobile data speeds of up to 42 Mbps HSDPA and 5.76 Mbps HSUPA. There's also Bluetooth 4.0 with A2DP, which can be used for low-power accessories (e.g. sports trackers), and NFC. MicroUSB handles the charging and PC connectivity, and there's also USB On-the-go support, so you can attach external flash drives to the smartphone as well. The MHL-enabled microUSB port also supports HDMI connections to an external monitor. A minor annoyance comes from the fact that the microUSB port and the docking pins are on the same side of the device. You can dock the phone to make sure it's being charged, while outputting videos over HDMI, but you'll struggle to find a comfortable position, as even an L-shaped micro-USB will cause the dock to wobble unless you place it on an elevated surface, like a book or something. 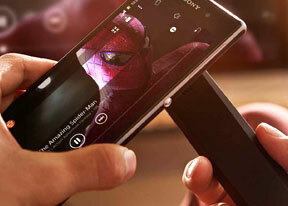 Sony's Media Remote has since been replaced by its TV SideView app, which offers the same basic functionality. Like Media Remote, it isn't preinstalled on the Xperia Z1, but you can get it off the Google Play Store for free. It will serve as a remote control for DLNA-capable BRAVIA TVs and Sony DVD/Blu-ray players too. There are a few versions of the interface ranging from simply changing the channels to mouse input and viewing disc history. This sort of a remote only works over the Wi-Fi connection. The Xperia Z1 comes with Sony's Smart Connect app, replacing the former LiveWare manager. With Smart connect, you can set your device to do a variety of things, like launch an app or set an alarm, whenever you connect an accessory, e.g. a headset or a charger, or at a preset time. It doesn't work with NFC though, which is very disappointing. In fact, there's no app to handle the NFC functions out of the box, which is strange considering Sony took the time to install a QR code reader app, which will see a lot less use. Luckily, there are plenty of capable NFC apps in the Play Store. The Sony Xperia Z1 comes with Google Chrome as the default web browser out of box instead of the generic Android browser. While the minimalist interface hasn't changed since Chrome launched on Android, the browser is being constantly refined by Google, and this has resulted in one of the smoothest and most powerful browsing experiences we've encountered on a mobile. Chrome runs ono the WebKit rendering engine, so underneath the minimalist UI it's basically the same as all Android stock browsers. A brand new setting is called Reduce data usage and does what it says - Google servers compress the webpage (using Google-developed tech like SPDY and WebP) and send them to the phone. You can check the graph to see how much data you've saved. Unlike Opera Mini, this mode keeps the full functionality of web pages. Also, secure connections bypass the Google servers for privacy reasons. Also, keep in mind you can use the Small app browser, which lets you surf while doing other things on the large screen. Unfortunately, there's no easy way to switch from Chrome to the floating browser. The Sony Xperia Z1 comes with the OfficeSuite 7 viewer. OfficeSuite 7 lets you view Word, Excel, PowerPoint, PDF along with plain text files. Just view them though, as you'll have to buy the Pro version if you want editing capabilities as well. The Notes app has made its way onto the Xperia Z1, except this time its drawing capabilities have been moved to a separate Sketch app. It's pretty simple to use - you can select the color of the note/sketch and just start typing or doodling. You can customize a wide variety of drawing modes, backgrounds, and stencils, and there's also Evernote integration. The stopwatch, world clock and timer are also available from within the clock app. The Timer function now has a history option, and the world clock features a cool slider which helps you quickly figure out the local time in another city. Another helpful tool is the Update center, which checks for updates for your phone and your apps. You can enable automatic download with the option to use Wi-Fi only. The Sony Xperia Z1 also comes with Google+ and Facebook apps out of the box. The Facebook app also has a nice widget that will show you updates on the homescreen. The Sony Xperia Z1 has a built-in A-GPS receiver with GLONASS support, which managed to get a lock in about a minute. If all you need is a rough idea of where you are (within 150 meters) you can use the Cell-ID and Wi-Fi network lock, which is very fast as well.